Welcome to my family history site! Here you'll find a large part of the information I've discovered about my ancestors and their extended families during the last fifteen years. As you browse through this site please keep in mind that it is a work in progress. Sometimes the documents may be attached to the source references. To get to them please click on the source links under each individual's entry. On the person pages you may see the following icons next to individuals' names. They indicate which branch of the family tree they belong to. You can start exploring the site using the links above, or continue reading below to learn a little bit more about me and my research. For additional charting flexibility in exploring my family tree please see the TNG companion site. One of the greatest parts of family history research is the connections that I have made with fellow researchers and relatives throughout the world. If you find a connection to any of the people or places mentioned here, I would love to hear from you. I may have more information that has not yet found its way onto the site and I would also like to learn from you. So, please drop me an e-mail at . This links to my digital family photo albums. It includes most of the older photos that I am lucky enough to have along with a selection of more recent ones. The main focus is on the Rafael, Baer, Krieger and Löwenstein families from the 1920s onwards. A request to all relatives: One of my goals for my family history research is to build a story about each individual family member. 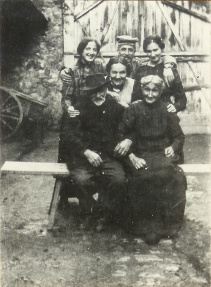 Family photographs provide another important connection to each individual. Please consider sharing with me any special family photos, both old and more recent, that you may have. With your permission, I will also include them in the Photos section of this web site. Thank you. My interest in family history began in 1997 when I was 13. 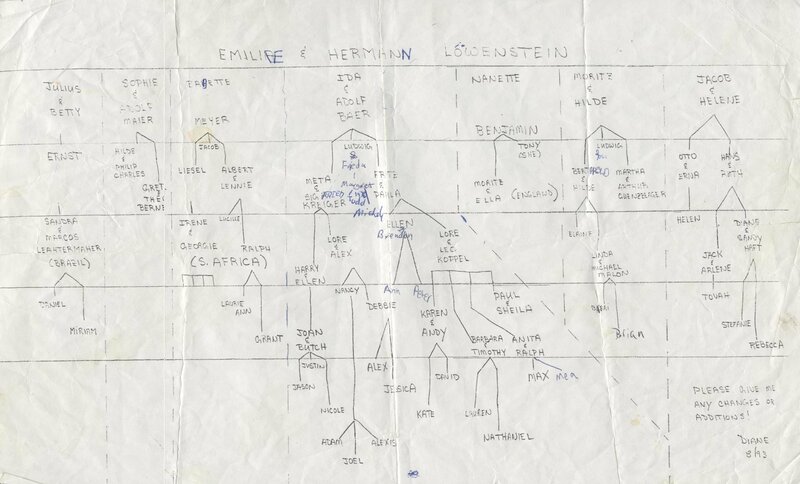 It started with a family tree that was put together for a Löwenstein family reunion in 1993. I came across the tree a few years later and started asking my grandmother, Lorie Krieger, questions about her parents and their cousins. At the same time, I discovered the resources of the LDS Family History Centers and JewishGen. Its Family Finder connected me to a number of fellow researchers and distant relatives around the globe. One of them, Werner Frank, provided me with a family tree going back to the 1600s. By this point I was hooked. Thanks to the help of many cousins I have gained a better understanding of where my ancestors came from and what their lives were like. Additional insight into their lives has come from a variety of records, which are still preserved in archives in the U.S., Germany and Italy. Most of my research efforts to this point have been focused on my maternal ancestors. My mother's father, Alex (Axel) Rafael, was born in 1921 in Gablonz, Czechoslovakia. His ancestors had lived in Bohemia and Moravia for centuries. His paternal grandmother however was born in Hamburg, Germany. He immigrated to the US in 1938, followed by his parents and sister in 1940, after they spent almost two years in Port-au-Prince, Haiti. My grandmother, Lorie Krieger, was born in Munich, although both of her parents were born in Weingarten, Baden. She was lucky enough to get out of Germany in February 1940 with her parents, Meta and Siegfried, and grandmother, Ida Baer. Both of my maternal grandparents lost aunts, uncles and cousins in the Holocaust along with a great number of more distant relatives. I feel it is especially important to remember the stories of these lost individuals and their communities. Furthermore, the relatives that were able to emigrate from Germany and the rest of Europe were scattered around the globe. Today descendants of these families live in the U.S., Canada, Argentina, Israel, South Africa, France, England, and Australia, among other places. These are families that share a common past and that constituted a vibrant part of their communities that were torn apart. My paternal ancestors came from Southern Italy between 1884 and 1905. One branch however had its origins in Kaunas (Kovno), Lithuania. My surname should be Calzaretta but for some reason after my great-grandfather and his parents arrived in the US, it was changed to Calzareth. Most people with the Calzaretta surname can trace their origins back to Oliveto Citra near Salerno in Campania, Italy. My Micallo (Michaels) ancestors lived in the city of Naples while the Della Monica family was originally from Cava de' Tirreni (near Salerno). FamilySearch recently digitized the vital records of the province of Salerno and they are now online at Antenanti. I have visited the archives in Salerno twice, but have not yet come close to exhausting the vital records and notary documents that are stored there. My goal in doing this research is to have more than just a family tree with lists of people's names and dates. I'm motivated by the desire to learn more about the details of my ancestors' lives. It's fascinating to learn about their occupations, immigration, daily lives and how they fit into the larger scope of history. Personal interviews, archival records and the assistance of relatives and fellow researchers have all provided invaluable assistance. My plan is to someday write a book. I don't anticipate arriving at that point in the near future as there is still much information waiting to be uncovered. Until that time this site serves as a way to update everyone on what I've learned so far. If you have any questions, I'd be glad to answer them. Thank you for your interest in my research.